One of the most uniquely Catholic practices is praying the Rosary. Let’s talk about what this is. The Rosary comes to us from St. Dominic, founder of the Dominican order. He received a vision of the Virgin Mary with rosary beads in her hand, which inspired the prayer. She also gave him the following promises for everyone who prays the rosary. Those promises are the reason I pray the rosary. I like the idea of the Virgin Mary calling me her son, as stated in #14. I feel that if she was Jesus’s mother, that means she was an especially good mother–look how well her son turned out! The Rosary is prayed like this. First , you make the sign of the cross and kiss the Crucifix. While holding the Crucifix, you recite the Apostle’s Creed. Then you say the Our Father while holding the first bead. On the next three beads, you recite the Hail Mary once per bead. After that, you say the Glory Be. The heart of the Rosary comes next. There are four sets of mysteries, events that occurred during Jesus’s ministry and in Mary’s life. While praying the rosary, you meditate on these events. It is suggested that you use a specific set for a certain day of the week. The Joyful Mysteries are said on Mondays and Saturdays, and on Sundays in Advent. The Sorrowful Mysteries are said on Tuesdays and Fridays, and on Sundays in Lent. Glorious Mysteries are said on Wednesdays and Sundays. Finally, the Luminous Mysteries are said on Thursdays. 1. The Annuciation of Jesus. 2. The Visitation to Elizabeth. 4. The Presentation of Jesus. 5. Finding Jesus in the temple. 3.Descent of the Holy Spirit. 4.Assumption of the Holy Spirit. 5.Coronation of Mary as Queen of Heaven. Each bead is grouped into five groups called decades. You start a decade by saying the Our Father, and then you meditate on each of the mysteries in order as you say one Hail Mary per bead for the next ten. Then you say the Glory Be and the Fatima Prayer: O my Jesus, forgive us our sins, save us from the fires of hell, and lead all souls to Heaven, especially those most in need of your mercy. This is repeated for each subsequent decade. That’s it. The whole process should take anywhere from 15 to 30 minutes. Patron Of: US (Immaculate Conception), France (Our Lady of Assumption), Portugal (Our Lady of Fatima), Argentina (Our Lady of Lugan), Australia (Our Lady Help of Christians), Brazil (Immaculate Conception), Chile (Our Lady of Mt. Carmel), Corsica (Immaculate Conception), Dominican Republic (Our Lady of High Grace), Mexico (Our Lady of Guadalupe), Paraguay, Phillipines, Slovokia, and South Africa. 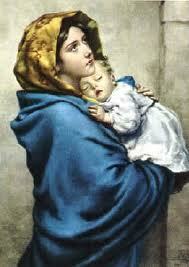 Info: The Virgin Mary is probably one of the most celebrated women in the Bible. According to tradition, her parents were named Joachim and Anne. It is believed that Mary was probably 15 years when Gabriel informed her that she would become the mother of Jesus. As a Catholic I was taught that, like Jesus, she too was immaculately conceived. Some of you may wonder why the Perpetual Virginity is included in the doctrine. Pope John Paul II gave an excellent analogy. In the Old Testament, the Ark of the Covenant was so holy, that you could not even touch it. Because Mary is the New Ark (meaning Jesus was in her womb), Joseph did not wish to touch her. She was far too perfect. In fact, one of Mary’s many titles is Theotokos, which means “God-bearer” in Greek. As a Catholic, I was taught that Mary was more than the Mother of God, she is also the church’s “spiritual mother.” (Catechism par. 963) We revere her as a person worthy of praise and respect for her obedience to God. Although we pray special prayers to her, she is not worshiped. (Catechism par. 971) Honor is not the same as worship. When we invoke her name, we are asking her to pray for us, much like if you were to ask me to pray for you. It is not so much us praying to Mary, but with her. For the longest time, I felt that Mary was unapproachable. She was immaculately conceived. How could I, a sinner, even hope to be worthy of her aid? But then I learned of her title as Our Lady of Sorrows. This made me realize something I never considered, and I’m sure some of you haven’t either. Even though Mary was not crucified with Jesus, she might as well have been. She had to witness in emotional anguish as her own son, her flesh and blood–her God–was beaten, humiliated, and crucified. She could do nothing to stop her. Think how hard it was for her to watch! I realized here was someone who could certainly help me. She was still human, even though she never sinned. She played a vital role in salvation as Jesus’s mother. She suffered in the most horrible way any mother could. How could I not accept her help? I once dreamed about the birth of Jesus. I dreamed I was there with my guardian angel as Mary brought forth the Christ Child. She then passed Jesus around so everyone could hold Him. When it came to my turn, I refused. Surely, I, a sinner, was unworthy of even holding Jesus. But my guardian angel told me, “That is the whole point, my child. No one is worthy of Jesus.” I realized the point of the vision. I am unworthy of God’s love and salvation, yet I am receiving it anyway. Summary: This is the true story of Bethany Hamilton, a pro surfer who lost her arm to a shark attack. Review: I am a huge fan of inspirational stories, so I checked this movie out. I liked how Bethany narrated the opening shots by telling us that she was born to surf. Her parents were champion surfers and they lived in Hawaii. She tells the audience that the reason she’s so competitive is that she has two brothers who also surf. We also learn that she is homeschooled and her family is evangelical Christian. Her best friend is Sara, her youth minister (played by Carrie Underwood, of “Jesus Take the Wheel” fame). Another thing I liked was Bethany’s perseverance. She tries her best to keep a positive front and adjust to the loss. She does very little rehab, and forces herself to adjust on her own. When she tries out for a meet and loses to an aggressive competitor, her friends lash out at her rival, but Bethany objects because her rival sees her as an equal and is not doing any favors because she is handicapped. Later in the movie, she takes a turn for the worst and goes into a depression. It is not until she decides to join Sara on a charity drive in Thailand that she finally realizes that even though she doesn’t have two arms she can still make a difference. She receives lots of fan mail, including one from a similarly-handicapped child. This gives her the confidence she needs. Her father designs a special board that will make it easier for her to get onto it and/or steer. When she meets her rival one more time, she actually thanks her for pushing her so hard. So for the most part, I think this was a great movie. If you want a good inspiring story, watch it.